Richard Green was the son of a merchant. He studied in Oxford and took orders. He was an eloquent preacher and popular with his parishioners. At the same time he studied history and he wrote for the Saturday Review. He left the church and obtained a librarianship at Lambeth in 1868 to enable him to focus on history. His "Short History of the English People" (1874) was an instant succes and was expended into four volumes between 1877 and 1880. In 1877 he married the Irish historian and nationalist Alice Stopford. Green wrote several other books but he suffered from tuberculosis and he died in Menton in 1883. 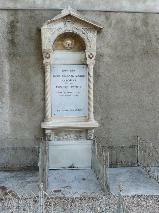 The grave of John Richard Green at the Cimetière du Vieux-Château, Menton.